This is an LPN to ASN program. Applicants must be a Licensed Practical Nurse to apply. Learn more about the Associate of Science in Nursing program! The OTC Associate of Science in Nursing program has been awarded accreditation by the Accrediting Commission for Nursing Education. Our program received full approval by the Missouri State Board of Nursing. We designed our program as an LPN to RN program that permits the qualifying LPN to complete the RN nursing courses in 36 weeks. Graduates who are eligible to apply should write the NCLEX-RN exam to become licensed as a Registered Nurse. The Bureau of Labor Statistics states that it expects the employment outlook for RNs to increase faster than average for all occupations. Graduates may go to work in hospitals, in inpatient and outpatient departments, physician offices, nursing care facilities, home health care services, government agencies and outpatient care centers. The program encourages applicants to attend a nursing advising session to learn what it will require prior to and during the application process. 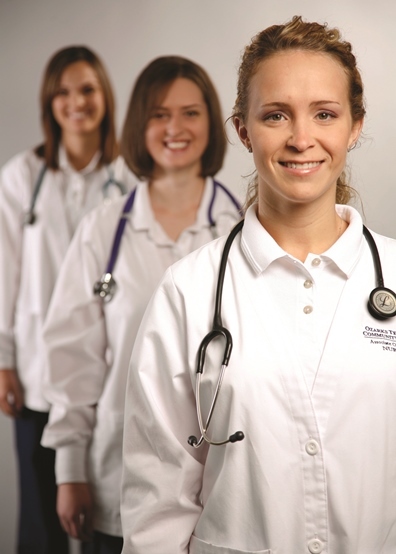 We offer nursing program advising sessions frequently and no appointment is necessary. We encourage current OTC Practical Nursing students who intend to graduate in July to apply for the OTC ASN program and contact wheelert@otc.edu to learn more about the “conditional acceptance” opportunity. Questions that cannot be answered via the provided links should be emailed to wheelert@otc.edu, or you can contact the Allied Health office in Lincoln Hall, room 210, on the OTC Springfield campus at the following numbers: 417-447-8803, 447-8804 or 447-8954. The Accrediting Commission for Education in Nursing (ACEN) awarded the OTC Associate of Science in Nursing program accreditation. The location of the ACEN is 3343 Peachtree Road NE, Suite 850, Atlanta, Georgia 30326. You can reach the commission at 404-975-5000, by fax at 404-975-5020 or by email at info@acenursing.org. Or visit their website at www.acenursing.org.